Dry mouth is an unpleasant and embarrassing condition. Whether your new mouthwash has a high alcohol content that’s drying you out, you just ate dry food, or you are going through cancer treatments, dry mouth is the result and can be quite uncomfortable. Beyond leaving you drinking glass after glass of water to no avail, dry mouth can also have a negative impact on your oral health, and as a result, your overall health. Dry mouth impacts roughly 10 percent of the population, but this only accounts for those who know that they have it. Generally, people assume dry mouth means that your oral cavity feels like a desert and contains virtually no saliva, but in reality, any amount of saliva lower than what’s expected of a healthy mouth is cause for concern. 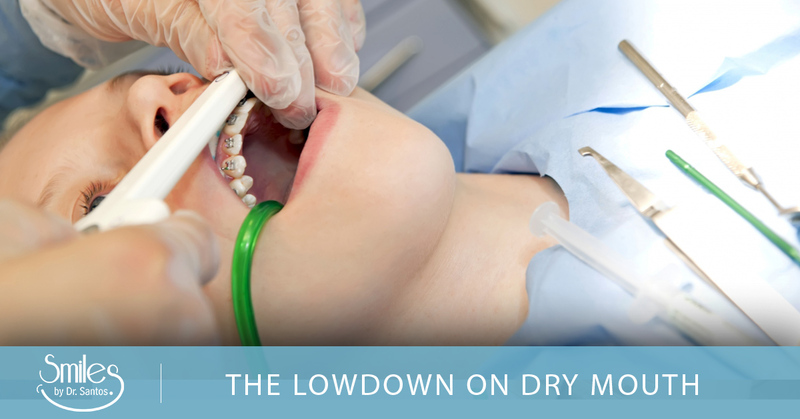 If you’re not sure whether or not you have dry mouth, your dentist in Manahawkin should be able to diagnose this condition for you. It’s important that they do, because untreated dry mouth can create a variety of health issues. Cavities: It’s not just poor dental hygiene or a sugary diet that causes cavities; in reality, dry mouth plays a huge role in cavity formation. Saliva protects your teeth from bacteria that excretes acid onto your teeth. Without sufficient saliva, your teeth are not protected from these acids. A mouth without proper amounts of saliva also drops in pH levels, making the environment more acidic and allowing the bacteria to multiply. Imbalanced Oral Microbiome: The microbiome of the mouth is similar to that of the gut: when it’s off, it impacts your overall health. Dry mouth throws off the balance of the microbiome, causing more bad bacteria to grow and killing off more good bacteria. Digestive Problems: Digestion begins in the mouth. If you don’t have enough saliva, you are not breaking food down sufficiently. In addition, if the pH level of your mouth is acidic, it can throw off the balance of bacteria in your gut. Mouth sores: With an acidic microbiome and delicate oral tissue, it’s very common for people with dry mouth to develop mouth sores, particularly cancer patients. Mouth Breathing: You may be breathing through your mouth without even realizing it, particularly when you’re sleeping. When you’re sleeping, your saliva production slows naturally, and when you breathe through your mouth, it makes it even dryer. You may wake up very thirsty or have difficulty talking when you wake up. Tobacco: Whether you smoke or chew it, tobacco can decrease saliva production and disrupt the bacteria in your mouth. Stress: More and more research demonstrates how destructive stress is to our health, and as it turns out, it may also cause dry mouth. If you have a sudden onset of dry mouth for a few days, it’s time to step back and think about what may be causing it. Dehydration: Many people are dehydrated, only realizing it when it becomes severe. If you feel thirsty, it means you are already dehydrated. Make sure you are drinking at least eight 8-ounce glasses of water a day. Chemo/Radiation: Both of these cancer treatments can cause dry mouth. Prescription Medication: Dry mouth is a common side effect of many medications. Certain Diseases: Dry mouth is a symptom of a number of health conditions, including rheumatoid arthritis, HIV, diabetes, and Alzheimer’s. Dry mouth is unpleasant and can be detrimental to your health, but the good news is, it is treatable. There’s a good chance that mouth breathing is contributing to your dry mouth. Make a point to breathe out of your nose and to assess whether or not it is due to an underlying condition, such as sleep apnea or allergies. You may consider working with a myofunctional therapist to help train the muscles of your mouth to comfortably stay closed. Certain foods cause mouth dryness, including dry foods like crackers and chips, sugary foods and drinks, spicy foods, salty foods, and citrus fruits. Avoid these foods if you have dry mouth, and focus on eating moist, lukewarm foods. Dehydration is a common cause of dry mouth. Make sure you are drinking enough water every day — at least eight glasses of water. If you’re an athlete, this should be even more. Caffeinated beverages can also dehydrate you, so practice moderation with coffee and certain teas. There are products on the market now that can help you cope with the symptoms of dry mouth, such as Biotene gel. While this does not cure dry mouth, it may help you feel more comfortable. We can help you identify the source of your dry mouth and help you be as healthy as possible. Contact Smiles by Dr. Santos for a dentist in Manahawkin!